What is Chiari-like Malformation and Syringomyelia? 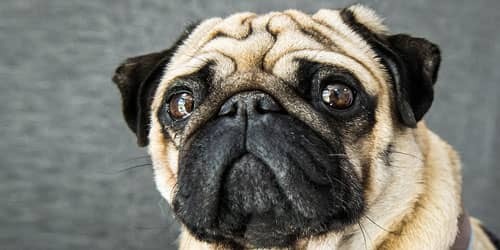 Chiari-like malformation and Syringomyelia are complex conditions which affect the brain and spinal cord in dogs, and may be found in some brachycephalic (‘short-faced’) feline breeds e.g. Persians. Syringomyelia is a disorder of cerebrospinal fluid (CSF) which can occur when there is obstruction of flow of the fluid from the ventricles in the brain to around the spinal cord. Fluid is forced or sucked into the spinal cord resulting in dilated fluid filled cavities. This can damage nerves carrying messages to and from the brain. Chiari-like malformation, a condition characterised by a mismatch in skull and brain size (brain too big and skull to small) is the most common cause of syringomyelia in dogs. Syringomyelia will also occur with other types of cerebrospinal fluid obstruction e.g. secondary to spinal cord injury or an arachnoid diverticulum. What causes Chiari-like Malformation and Syringomyelia? Cerebrospinal fluid (CSF) is produced in the brain and has many functions. One of the most important is to protect the delicate nervous system and to support its weight. The brain and spinal cord floats in this this fluid in a sac called the meninges. The cerebrospinal fluid acts as a buffer to protect the nervous system from the potential rise in pressure in the skull every time the heart beats and sends a large volume of blood to the brain. If this volume was not accommodated then pressure in the skull would increase causing damage and pain. Disruption of this normal free flow of CSF from the brain to the spinal column is one important cause of syringomyelia in animals (including humans). The most common cause of this obstruction is a hindbrain herniation referred to, in dogs, as Chiari-like malformation. The analogous condition in humans is Chiari type 0 or I malformation. A Chiari malformation is a developmental abnormality whereby there is a difference in growth between the size of the brain (too large) and the skull (too short). Generally speaking the skull cavity is too short and the back part of the brain (brainstem and cerebellum) gets pushed into the hole at the back of the skull and obstructs the flow of the cerebrospinal fluid. What breeds are affected by Chiari-like Malformation and Syringomyelia? Chiari-like Malformation and Syringomyelia are most commonly reported in brachycephalic (short- head/faced) toy breeds. The condition is most commonly reported in Cavalier King Charles Spaniels, King Charles Spaniels, Griffon Bruxellois, Affenpinchers, Yorkshire Terriers, Maltese, Chihuahuas, Pomeranians, Boston Terriers, Papillons, French Bulldogs and Pugs. Chiari-like malformation and syringomyelia are present in many CKCS and other small breed dogs and may not cause clinical signs and may be identified as an incidental finding during another investigative process. The incidence of symptomatic Chiari-like malformation in affected breeds is not known and is difficult to determine. The most common clinical sign is intermittent pain and the behavioural signs of this may vary. For example, the response of many dogs (and people) with a headache is to be more withdrawn or less inclined to exercise and play however this is a very non-specific signs that may have a multitude of explanations. How can I tell if my dog has Chiari-like Malformation and/or Syringomyelia? There is a great variation to the type and severity of clinical signs a dog with this condition will show and some dogs will be asymptomatic. By far the most common clinical sign of syringomyelia is pain – this may manifest as spontaneous vocalisation, vocalisation or posturing in pain when moving or when being lifted, or a reluctance to exercise etc. The abnormal sensations previously listed can cause a dog with syringomyelia to attempt to relieve discomfort by scratching the neck without making contact, rubbing the face repeatedly or licking the paws excessively. Owners often report that their dog is worse at night; when first getting up; during hot or cold temperature extremes; or when excited. Certain postures may be more or less comfortable, e.g. some dogs prefer to sleep with their head in a raised position. Affected dogs are frequently overtly sensitive to touch on one side of the neck, ear, shoulder or chest. Of course, it is difficult to tell what our pets are feeling and some dogs may show these signs for completely unrelated conditions. Pain is positively correlated with syrinx width and symmetry i.e. 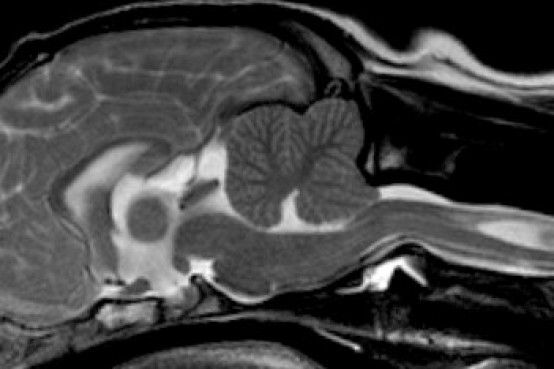 dogs with a wider asymmetrical syringomyelia are more likely to experience discomfort, and dogs with a narrow syrinx may be asymptomatic, especially if the syrinx is symmetrical. Dogs with a wide syrinx may also scratch, typically on one side only, while the dog is walking and often without making skin contact, such behaviour is often referred to as an “air guitar” or “phantom” scratching. Dogs with a wide syrinx are also more likely to have scoliosis (curvature of the spine). Syringomyelia may also result in other neurological deficits such as weakness and poor coordination and slow correction of abnormal limb position. Seizures, balance problems, facial nerve paralysis and deafness may also be seen; however, no direct relationship has been proven. This association may be circumstantial and it is important to rule out other causes. Chiari malformation appears to cause pain in some dogs with owners describing signs of head pain (ear and facial rubbing/scratching). This may be because of an increase in intracranial pressure or because compression of the brain stem can result a pain syndrome. 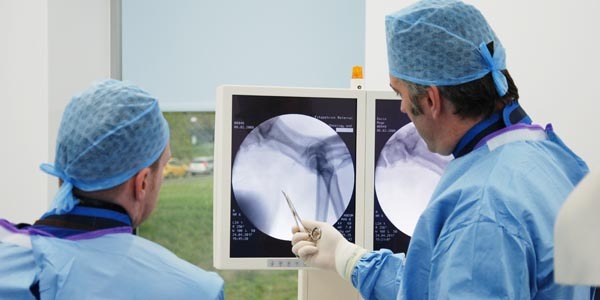 What conditions could have similar signs or be confused with Syringomyelia? The most important diseases are other causes of pain and spinal cord dysfunction such as intervertebral disc disease; CNS inflammatory diseases such as granulomatous meningoencephalomyelitis; vertebral abnormities such as atlantoaxial subluxation; neoplasia; and discospondylitis. When scratching or facial/ear rubbing is the predominant clinical sign, ear and skin disease should be ruled out. The scratching behaviour for syringomyelia is classically to one distinct area. How are Chiari-like Malformation and Syringomyelia diagnosed? 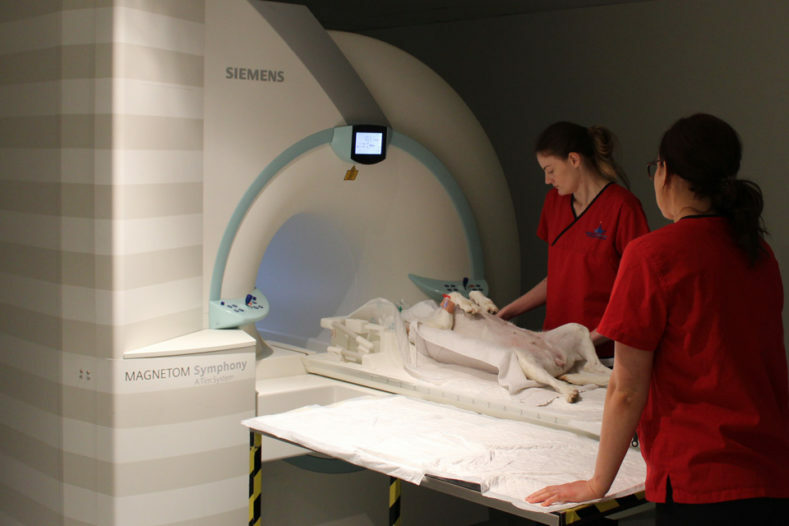 Magnetic resonance imaging (MRI) is essential for diagnosis and determining the cause of syringomyelia. We have MRI scanners on-site managed by our advanced diagnostic imaging team, which allows rapid diagnosis. 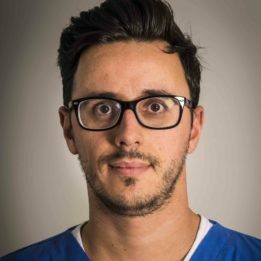 MRI scan is the most advanced imaging technique and provides more information than radiographs for diagnosis, however, patients must lie completely still for their MRI scans, and this is only possible with the use of general anaesthesia. 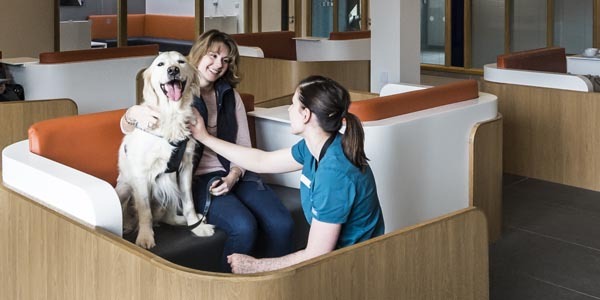 Your dog will have dedicated one-to-one care during their MRI or CT scan by one of our nurses from the prep nursing team who are all trained and experienced in anaesthesia. 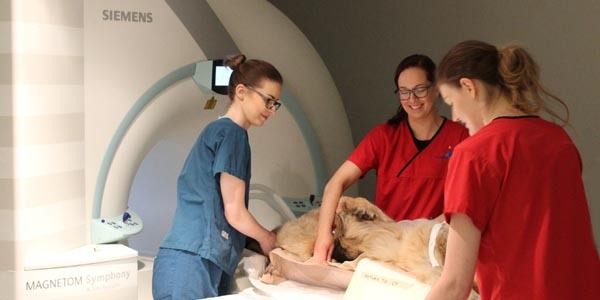 Advanced Diagnostic Imaging team preparing a patient for an MRI scan at Fitzpatrick Referrals Orthopaedics and Neurology. What are the treatment options for Chiari-like Malformation and Syringomyelia? Surgery may be a possibility to treat the condition. The goal of surgery is to decompress the foramen, allowing the fluid to flow normally. The most common surgical management is cranial/cervical decompression (also described as foramen magnum or sub-occipital decompression). The principle of this surgery is to allow CSF flow by removing the bone at the back of the skull (supraoccipital bone) and part of the top of the first vertebrae. Cranial/cervical decompression surgery is successful in reducing pain and improving neurological deficits in approximately 80% of cases with many cases doing well long term. However, about 50% of patients have a recurrence of signs within 2 years and the syringomyelia does not resolve – the clinical improvement is probably attributable to improvement in cerebrospinal fluid flow through the foramen magnum. As the majority of patients will respond to medical treatment surgery is generally reserved for patients with Chiari malformation only or in severe disease which fails to respond to medical management. In patients treated medically, i.e. without surgical intervention, typically the first drugs used for treatment of chiari malformation and syringomyelia are (unlicensed) drugs that reduce cerebrospinal fluid pressure e.g. furosemide, cimetidine or omeprazole. The principle of this therapy is that reducing cerebrospinal pressure reduces the driving force contributing to the syringomyelia. Some owners report a reduction in signs of apparent pain. If the pet is in pain then a non-steroidal anti-inflammatory drug (NSAID) is often prescribed e.g. firocoxib, carprofen or meloxicam. This may be in addition to one of the drugs above. For dogs with signs of neuropathic pain (e.g. severe pain; increased sensitivity to normally non-painful sensation such as touch; and scratching behaviour), an (unlicensed) neurogenic painkiller is more likely to be effective for example gabapentin or pregabalin. Corticosteroids are an option if pain persists or where available finances prohibit the use of other drugs however as these drugs can have long-term side effects and we try to avoid them. What is the long-term prognosis of Chiari-like Malformation and Syringomyelia? Chiari – like Malformation and Syringomyelia is rarely fatal however it can be a very painful disease and a minority of dogs are eventually euthanized as a consequence of uncontrolled pain. Typically lifelong medication is required and the problem is progressive in about three-quarters of cases meaning that the dogs require increasing doses of medication to control their signs. However, the majority of owners report that despite this their pets can enjoy a good quality of life. Most dogs retain the ability to walk although a minority may develop significantly weakness. What other things can I do to help my dog? The dog’s activity need not be restricted but you should understand that your dog may avoid some activities and not tolerate grooming of some body areas (e.g. one ear). 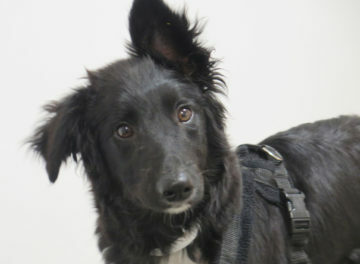 Simple actions, for example raising the food bowl and removing neck collars, can help. I want to buy a Cavalier – how do I get a healthy puppy? It is recommended that breeders screen their stock for syringomyelia and other diseases such as mitral valve disease and eye diseases. 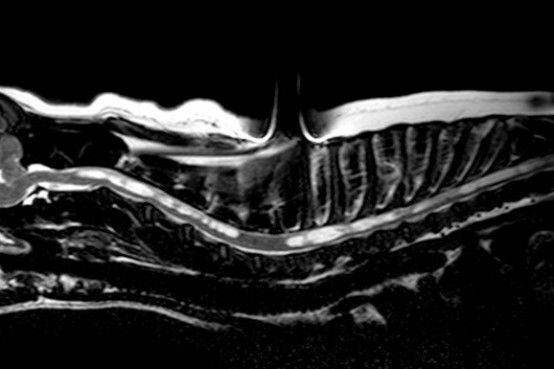 A BVA / KC scheme for MRI screening of syringomyelia is available. Current breeding recommendations for Cavaliers concentrate on removal of dogs with early onset syringomyelia from the breeding pool.